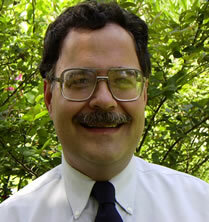 Michael J. Nault of Applied Biostratigraphix, Houston, Texas is the recipient of the Gulf Coast Section SEPM Distinguished Service Award for 2002. A native of New Orleans, Mike becomes the first multiple GCSSEPM Distinguished Service Award winner, having also received this honor in 1988 at the GCAGS/GCSSEPM Annual Convention in New Orleans. Mike began his long involvement in service to the Gulf Coast Section SEPM serving as the GCSSEPM Associate Editor for the 1980 Lafayette GCAGS Transactions. Since 1981, he has served as GCSSEPM Judging & Awards Chairman for the GCAGS convention 19 times, including this year in Austin. Mike has thrice served as GCAGS Vice Chairman for GCSSEPM - 1991 (in Houston), 1998 (in Corpus Christi) and 2000 (in Houston). He has served as an elected officer of the GCSSEPM, including President (1992), Vice President (1983-84 & 1989-90), and acting Vice President (1994). Mike has been a member of the Board of Trustees of the Gulf Coast Section SEPM Foundation since 1997, serving as Board Chairman in 1999 and 2002. The GCSSEPM Foundation is the sponsoring organization of the Bob F. Perkins Annual Research Conference held each December in Houston. Another service to the section has been as GCSSEPM Display Booth Chairman for GCAGS and AAPG Conventions for the past 10+ years (a thoroughly thankless task). Mike has also contributed to the ever-growing volume of geosciences literature of the Gulf Coast. He was both a contributing author and co-editor for the GCSSEPM Foundation sponsored Gulf Coast Taxonomic Equivalency Project (1995-2001), which produced two important books on Cenozoic foraminiferal marker species and paleoenvironments entitled: Gulf of Mexico Basin Biostratigraphic Index Microfossils, A Geoscientist's Guide: Volumes 1 & 2 on Oligocene through Pleistocene Foraminifers (1999) and Volume 3 on Paleocene through Eocene Foraminifers (2001). These two books will play a vital role in preserving the legacy of biostratigraphy in Gulf Coast petroleum exploration and development long after the last microscope light has been turned off. Since 1993, Mike has co-authored (with S.Q. Breard and A.D. Callender) seven full papers in the GCAGS Transactions (to accompany the GCAGS Convention poster presentations), on foraminiferal biostratigraphic models and applications. Two of these papers have received the GCSSEPM Best Published Paper Award (now called the GCAGS / GCSSEPM Grover E. Murray Best Published Paper Award) - second place in 1993 and first place in 1996. He also contributed, with his co-authors and R.A. Denne, a deep water biostratigraphic zonation paper and poster for the 2000 Gulf Coast Section SEPM Foundation Bob F. Perkins Research Conference on "Deep Water Reservoirs of the World"
Mike is married to Mary B. Todd, a Houston probate attorney. His other major interest is in Amateur Radio Communication. He holds the FCC's highest class Amateur Radio license (Extra) and 2 major FCC Commercial Radio Licenses: the General Radiotelephone Operator (GROL) and the Global Maritime Distress and Safety System Operator / Maintainer (GMDSS O/M; both of these with Ship Radar Endorsement. Mike serves as a volunteer examiner where he assists in administering FCC Amateur Radio License exams and Amateur Radio Emergency Communication Certification Examinations in Houston. He is also Chairman of the Greater Houston Area Chapter of the American Red Cross Volunteer Disaster Communications Committee. All volunteer organizations have a select few members who form the core leadership of that group. Michael is such a core member of the Gulf Coast Section SEPM. He has consistently contributed and served the section for more than two decades. So, in recognition of his continued long and dedicated volunteer service, it is most fitting that Michael J. Nault become the first two-time recipient of the Gulf Coast Section SEPM Distinguished Service Award.